Saturday, August 1 from 4 – 7 pm at the Rec Center. Free Family Entertainment featuring Disney's Cars. Enjoy games, activities, and crafts for kids of all ages, and adults. Delicious and nutritious food and beverages. And of course, plenty of popcorn. Get to know your neighbors and other parents. Win fabulous raffle prizes. All proceeds benefit the arts, field trips, and after-school programs at Fairmount Elementary School. Hosted by Fairmount School PTA, Upper Noe Community Recreation Council and FNVRC, and these local merchants: Bom Dia Market, Bricks 4 Kidz, Chuck’s Sun Valley Grocery, Church Produce, Curator, DAVIDsTEA, E & J Market, Edible Excursions, K9 Scrub Club, La Ciccia, Olive This Olive That, One Stop Party Shop, Pomelo, The Buzz, Twin Peaks Pizza, Café XO. Registration for Fall Activities begins Saturday, Aug 1 at 10 a.m. View the Fall Catalog and register online at www.sfreconline.org or stop by the Rec Center between 10 a.m. and 2 p.m. Staff will be happy to assist. The Rec Center will end Summer Schedule and resume regular hours of operation beginning August 17. On Mondays, the building will once again be closed but will be open Tuesday - Friday, 9 - 9 and Saturday, 9 - 5. The hours for the park grounds do not change and will remain open daily from 6 a.m. – 10 p.m.
Tue 12 – 3 p.m., 6:30 - 8:30 p.m. Wed 12 – 3:30 p.m.
Thu 12 – 8:30 p.m.
Fri 12 – 3 p.m.
Tue 1 - 3:30 p.m. Wed 1 - 2:30 p.m.
Fri 1 - 3 p.m. Sat 12 - 4:30 p.m.
Girls’ Volleyball The Fall Schedules adds Volleyball for girls ages 6 – 9 on Wednesday at 4 p.m. and 10 – 13 on Friday at 4 p.m. The younger group learns to set, assist and block and how to approach the net and spike that ball! The older group enjoys league play that provides a competitive atmosphere designed to challenge girls. Passion for volleyball has grown for all ages. 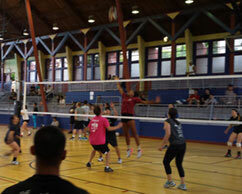 Upper Noe added an additional net last spring and has expanded free adult Drop-in Volleyball sessions to include Wednesday and Friday evenings from 6:30 to 8:30. 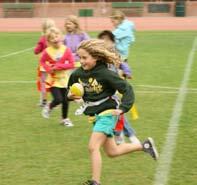 Boys and girls, get in on the action as Flag Football returns to Upper Noe. Two groups, 8 - 10 and 11 - 13 year olds will learn scheme blocking, running plays, passing plays and route running while engaging in 5 on 5 and 7 on 7 competition. Players have the opportunity to learn different positions and the skills needed to be successful at each. Put your mouthpiece in and get your game on. You asked for it, you got it. It has been seven years since Upper Noe had a facelift. Gradually, the heavy use of our lovely park has started to show. No one had a focus yet on the chipping and peeling paint on the walls, fences and equipment around the entryway and playground. But it bothered Friends’ Molly Sterkel, who pointed it out and asked, “Why can’t they keep this place looking nice?” Rec & Park took notice. Work orders went in and got immediate response from the painters. They made this area look brand new within the month. We love these guys. It pays to speak up. So, if you see something that needs improvement, please bring it to the attention of Cheryl in the office. Tots and their toys are taking a toll. As disappointing as it was to have the floor-refinishing job for the auditorium and gym cancelled last spring, July brings a new budget cycle and renewed hope for some much-needed attention. Maintenance has scheduled the floor job tentatively for the last two weeks of December. Keeping the Playfield Safe. Despite a persistent drought, Rec & Park gardeners will continue to water and maintain athletic fields at county parks. At Upper Noe, gardeners scaled back on a much-needed, extensive renovation of the field that was planned for last winter but curtailed by the lack of rain. Our heavily used field plays host to throngs of small children and healthy turf makes for a safer play surface. 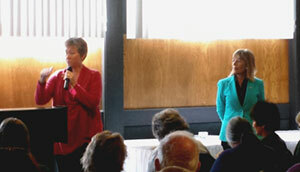 It was standing room only at Jackie Speier’s town hall meeting at Nick’s in Pacifica on July 18. Recently appointed Golden Gate National Recreation Area superintendent Christine Lehnertz introduced herself and spoke passionately about the Centennial of the National Park Service next year on August 25. She heard first hand and at length about the importance of recreation in our daily lives. Congresswoman Speier was clear of her expectations for GGNRA management plans to reflect the interests of the community. FNVRC reminded Speier and Lehnertz that, as an integral part of San Francisco’s necessary open space, any measure to curtail recreation in the GGNRA has the potential to strain our local park system. On Wednesday, July 8, Upper Noe Neighbors hosted their first meeting without long-term president, Vicki Rosen, who passed away June 11. 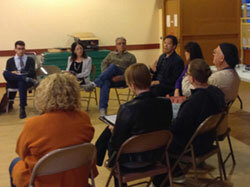 In the spirit of her leadership, Acting President Marianne Hampton held a traditional and lively roundtable discussion. San Francisco State Political Science Instructor David Lee presented the Open Government Act ballot initiative created by his students and headed for the polls this November. It seeks to make City meetings more accessible through live-stream video, remote commenting and time-certain scheduling of comment periods. San Francisco Metropolitan Transportation Authority sent two communications reps to note neighbors’ detailed and passionate concerns about the changes to San Jose Avenue, Randall and Dolores Streets. 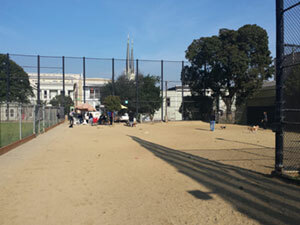 Friends of Upper Noe Dog Owners Group is applying for a SF Police Officers Association Community Investment Grant to upgrade the landscaping and seating for Joby’s Run. 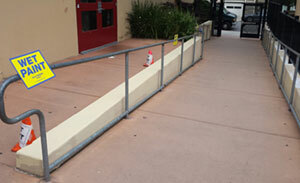 Plans would also install a new gate mid-section to make supervision and management easier. The $5000 grants foster positive experiences for the community like park equipment and urban beautification. Much of the current seating is structurally sketchy and while efforts to make visits more pleasant and homey, the comfort visual appeal can be lacking. This heavily used but tiny facility is just 10,000 square feet but carries the load of some much larger facilities. Users take responsibility for most day-to-day maintenance. Big thanks go out to everyone who grabs a broom or a rake and takes initiative to keep it nice for others. Meet at the office for directions of work area. Free community BBQ / celebration hosted by SF Police Department’s Ingleside Station bringing neighbors together in a safe and friendly atmosphere where they can also get to know the law enforcement officers that serve them.